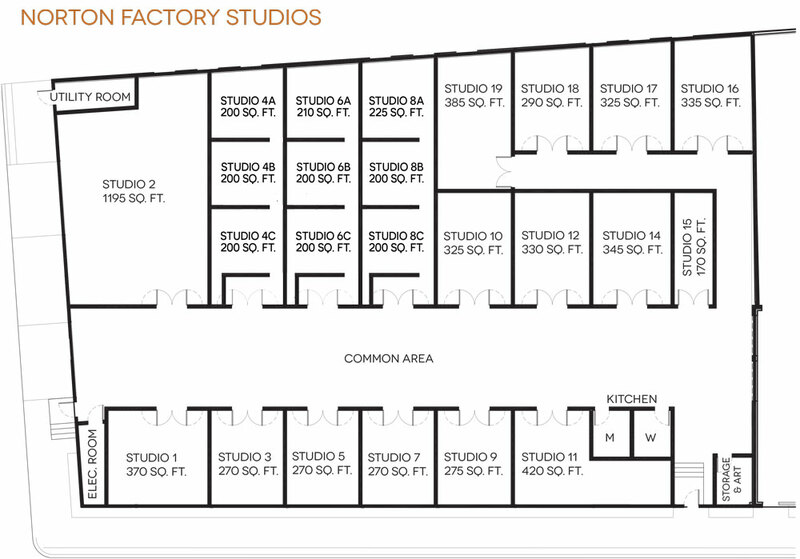 Norton Factory Studios is a creative studio building with 24 beautiful studios for rent. These studios are for fine artists actively pursuing exhibiting their work in professional galleries. Studios are leased on a yearly basis. When studios become available, a call for applications is announced. Applications are reviewed by a panel of Norton resident artists. Applicants are evaluated by their commitment to their work, artistic skill, and fit within the Norton Factory community. Please note that spaces are not live/work and cannot accommodate welding or manufacturing. Our building is not open to the public. If you are interested in touring our building, please contact us to schedule a visit.